Apparently available on 2017 models fitted with ATC. I haven't noticed it on mine, but to be fair I find Swift command a faff. Looks like ill have to go to night school to be able to work the caravan if i went back to swift, loots if technology to go wrong presumably expensive to repair or fix when out of warranty. 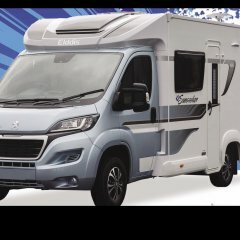 Let's have caravans that are built fault free, not all the stupid gimmicks which you are paying for even if you don't want them. Now caravanned 45 years without so I think I can manage a few more. Can we keep to my OP question. Pointless comments from luddites are not being asked for. Swift command is there for those that want to use it, much like the Apps on a smartphone. All these types of posts do is deter new members from asking questions, please no more sheep comments, if you want to debate SC start another thread. I've posted the same question on ST and havent as yet got such risible replies. Alko do offer an expensive on dash module for remote monitoring of the ATC, but its range is unreliable and its mainly available in europe. Cost just under £100. Do we not have enough distractions when we are driving already?? As Birdman1 states. ..you will feel when it activates, I do. Oh dear this is all getting a little out of hand. I thought the idea of his forum was for folks to discuss stuff they are interested in or think others may be. I guess if anyone thinks the post is not for them then maybe they should refrain from comment on the post an leave it to those who are interested in it. I have noticed swift talk does appear to discuss things with out such negativity. A genuine enquiry has been turned sour now for me. Moderator please remove or lock this thread. I work for a mobile phone company so obviously I'm in favour of anything technology related :-). IMHO this was a bad idea by Swift on many levels. Firstly, ATC is designed to operate without user intervention - a flashing light on the dashboard at a time when the combo is potentially in danger won't aid safety. Secondly, there was no mention - so I assume no capability- that access to things like stats (ie distractions) were disabled when in motion. Thirdly, every phone I've had can only pair to one Bluetooth device. So by pairing to this, it's not possible to pair to the car or headset so might encourage taking of calls etc in motion. I much preferred caravanning in years gone by when everyone had rickets and died at 45 ! Oh the simple days ! Quite like the sound of this facility, but can't see the point of connecting the ATC to your mobile phone whilst driving, especially will legal restrictions on phone use within cars, even with a holder . .. But will the ATC system connect to the vehicles Bluetooth so you can view the ATC function on the vehicles screen display. So now got the ATC remote monitoring working, and have to say very impressed with this system. Sargent had to "inform" my caravan that ATC was fitted so now I have a remote monitor of the system, which my co-pilot can refer to along with the tyre pal. Also found out today that I can view the alarm status on or off, and the battery level remotely, which I wasn't aware of. I'm sure it's ever so clever but as my dash board is already getting a bit like the flight deck of the Starship Enterprise something else to watch either by the driver or even the first officer can't be a good thing. I also reckon that although it might be entertaining to watch it come on when going round roundabouts or over speed bumps I'd hope it would be the last thing you'd be worrying about if you were having a "brown trouser" moment trying to wrestle the van back into line as it's going all over the road. Dangling Tyrepals, mobile phones, gps units and dash cams from the windscreen or dashboard, together with the stuff thats already there can't leave a lot of room to actually drive the car and must be extra distractions for the driver even if the FO is in charge of monitoring them all. You forgot to mention the rear view camera I also have. Just to add my two pennies worth, swift command is excellent and the rest of you WANT IT, just admit it. I was monitoring my battery being charged this morning with the 3 stage charger, and was surprised to see it using over 4 amps AC, but then it was putting double figures into the battery, DC current, while at the same time seeing 0. 4 amps inputting from the solar panel. It was like being back at work monitoring the plant through the Scarda screens. If that 4A is all into the charger, that implies over 70 amps into the battery and other 12v circuits, that seems unlikely! They're usually only rated at 220-250W. I've rarely seen 1A into the charger even into a flat battery. Low current AC measurement is notoriously inaccurate with the cheap clip over the wire type measurement device. Yes take those figures with a pinch of salt. 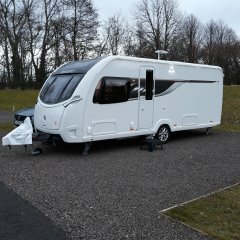 I was looking at the command AC current reading which reads around the same as the Owl 160 I used on my previous caravan, but while Owl took about 12 seconds to refreshed command takes about two, so I'm confident its reading near enough. There was a 32" TV and Humax on, probably the 170 W fridge also on mains, but nothing else as far as I know. Battery had dropped to 12. 4 volts over night due to me turning of the charger day before as the solar charge appeared to be sufficient, obviously no solar at night so the battery was running everything. It was when I noticed this drop that I jumped up to put the charger on, soon as I did that I saw the AC current go over 4 amps, which implied around a 1KW load, so I thought straight away something was right. Then I looked at charging current which I can't remember exactly but it was high around 13 amps, but it is a 25 amp power supply capable of supplying a large percentage of that 25 amp. Further investigation is required when I get round to it. Just remembered the Humax I've fed off the 12 volt socket. From the hand book 230 volts ac "
Those figures do seem odd don't they? Being fairly generous let's say max 25A @ 14v or around 350W. That's still a long way from 690W and would suggest an inefficient supply or poor power factor - unlikely given current EU legislation. In fact it would struggle to dissipate the internal heat. It doesn't really matter, but after a lifetime of designing electronic devices it just piques my interest. When working out what I can use on a low amp site I have always only allowed about an amp for the charger. Just goes to show. Always considered the PSU to be low usage, but then I wouldn't normally be looking so much. The old owl always kept our current down below trip levels, simply by being able to see the current flowing and being able to turn off appliances. You would be in your element with the swift electronics.